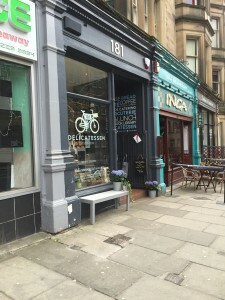 Bruntsfield is a little spot of gluten free heaven in Edinburgh! Packed with delis, cafes, shops and coffee stops, Bruntsfield is a terrific place for an afternoon potter, with a slice of gluten free cake. 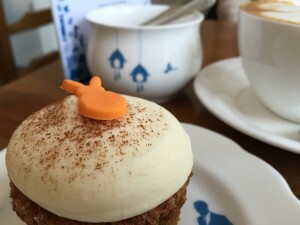 Now, we already know that Bruntsfield is home to the best gluten free cakes in Edinburgh, as it has a branch of the always superb, Cuckoo’s Bakery. I have reviewed the cafes in the past. 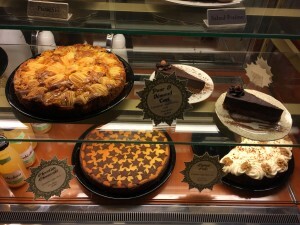 A few doors down is the massively indulgent, Artisan Cheesecakes, makers of the highest calorie products in the Universe! They are also makers of gluten free options, so we love them too. And the wonderful, Three Birds is just round the corner at 3 Viewforth – another place where GF is standard. However, in the interests of research, I have had a very good meander around Bruntsfield to identify what other gluten free options there are. I was not disappointed. 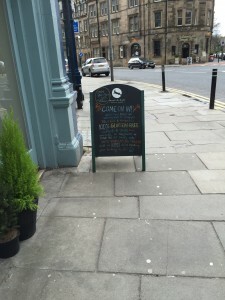 First up is the cafe with the best sign in Edinburgh, it says “100% gluten free”: The Moon and Hare. This vegan and gluten free cafe has a great range of healthy options and you do not even need to tell them you cannot eat gluten. That makes you feel relaxed before you even walk through the door. There are some fantastic choices of food here and the focus is on good quality, locally sourced organic produce. The cafe is totally gluten free AND totally vegan and they also cater for raw eaters, so it really does focus on food for the soul. Just next to the Moon and Hare is the 181 Delicatessen (their sp, not mine). The first thing that hits you on entering is the full range of Findlaters Gluten Free Bread. They receive a delivery on Fridays and will take a pre-order. However, on a Saturday afternoon there was still plenty of choice. 181 also has a cafe area and sells Puddledub meats, cheeses and lots of lovely looking delights. It is a cute and seriously friendly place. Further along you will come to a little shop called “Dig-in” – a community greengrocer. They sell proper veg and what many people do not realise is that they have a good wholefood section through at the back. Gluten free noodles, flours, biscuits and pasta is all there – so it is a good place to drop in and stock up. And the gluten free Bruntsfield delights just keep coming. Close to Dig-in is the beautiful Chocolate Tree shop and cafe. Pretty much all their cakes are gluten free and they have a gorgeous selection: carrot cake, pear and almond tart and chocolate cheesecake were all on offer when I stopped by. The chocolate, as you might expect, is also really special and the people are super-friendly too. It is not labelled gluten free, but I also highly recommend Christie’s butchers over the road – good quality food with traditional charm. It is bountifully gluten free in Bruntsfield!